I am a wife to a Wolverine comic book addict. I knew about his affair with ink and claws before going into our marriage, but I didn't fully comprehend the impact it would have on me and our future children. 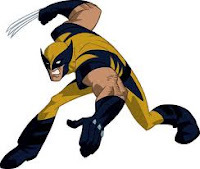 I thought it was cute and fun for my husband to collect action figures and plaster his walls with graphic art displaying adamantium claws and sideburns. I first knew we had a problem when I was expecting our oldest son. Naturally, baby names popped up around the sixth month of the pregnancy. I was scouring baby name books and lists. I pondered Benjamin, Ethan, Parker, etc. I looked to my family tree and the Bible for ideas. My husband turned to his stacks of comics. We had to carefully remove these gems from their acid free plastic covers and hold them just right- he didn't want to get oils from our hands on the pages or creases in the spines. He proceeded to explain why we should name our child Logan. Logan is Wolverine's "real" name for those of you who haven't had the fortunate experience of living and breathing all things X-men. I had to draw the line fast. I was not about to name my beautiful baby boy after a man who smokes cigars, has claws poking from his fists, wears yellow tights, and has a sworn enemy named Sabretooth. Really? After some coaxing I managed to rule out Logan, Charles, Scott, and Hank. I didn't want to have to tell my grandchildren that their father was named after an amnesiac mutant with super strength and healing abilities. I won the name battle, but it wasn't the last time I had to wage war on Wolverine. I put my foot down on hanging framed X-men posters in the living room. I had to concede storage space and all rights to decorating the basement, but at least not very many people brave his lair. We've had to negotiate costs of "proper" storage and the purchase of a special Wolverine issue. I can't even remember the number, but I think it had something to do with the Incredible Hulk. I didn't think a flimsy little comic book was worth that much money. I could buy a lot of milk with the money they were asking for it. He didn't agree and said he needed to buy, because he would never get a chance to see one again. I caved and let him enjoy his nerdom for a bit, but at least I don't have a son named Logan. We have also fought over action figures and E-bay. This argument has now become a source of jokes and laughs, but now he's mastered controlling his urge to bid. I cursed E-bay a long time after my husband had discovered it. Needless to say, we have a stash of painted pieces of plastic taking up space in our basement. Where was Professor X's mind control when I needed it? I could go on and on about my life with a comic book addict. I don't know how many hours I have sat outside a comic shop while he talked books with the clerks or the number of X-men cartoons, movies, and posters I have viewed. I know way too much information about Jean Gray and Cyclops' family tree. I know Gambit, Rogue, Nightcrawler, and so many more characters, because my loving husband has named all our computers and servers after them. I don't like to admit it, but after writing all these little details I can say his passion is endearing and a little on the cute side. I may not share his passion for Stan Lee and onomatopoeia in speech balloons, but he has sat through a lot of BBC miniseries and Jane Austen remakes. Our children have learned a lot about collecting, the value of saving and working for something you really want, right versus wrong, and that Mom doesn't appreciate sideburns and cigars. Wolverine might not be the namesake I wanted, but he does have a lot to offer my husband and sons. I guess he's not my nemesis, more like a frenemy. Who knows? I might let my husband name a dog someday. . .